Australia and Japan have qualified for the FIFA Women’s World Cup Canada 2015. Both nations qualified on Sunday 18 May through the 2014 AFC Asian Women’s Cup in Ho Chi Minh, Vietnam. Australia advanced after edging hosts Vietnam in a 2-0 victory in their final Group A tie on Sunday at Thong Nhat Stadium while Ho Chi Minh City: Emi Nakajima, Mizuhu Sakaguchi and Chinatsu Kira all scored twice as Japan rolled to a 7-0 win over Jordan. An unfortunate own goal by Vietnam captain Le Thi Thuong on 42 minutes gave Australia the lead and then until Katrina Gorry’s strike from the edge of the penalty area doubled the Matildas lead and ended any hope of a Vietnamese come-back with a minute of regulation play remaining. Australian head coach Alen Stajcic was less than impressed with his team’s finishing. Kira opened the scoring for Japan on 26 minutes, before Nakajima struck her first a minute before half-time to take Japan in at the break two goals to the good. After the interval Nakajima completed her brace and two second half goals from captain Sakaguchi, an own goal from Ala’a Abu Kasheh and a second from Kira ensured that Japan would qualify top of Group A above defending champions Australia by virtue of a superior goal difference. Japan coach Norio Sasaki knows the depth of his squad and has now used every player of his 25-women squad in some capacity in the tournament. “Our first aim for today’s match was to get the three points, then we wanted to get several goals to ensure that we finished top of our group,” said Sasaki who was full of praise for Kira after her performance in a more forward role than she is used to. 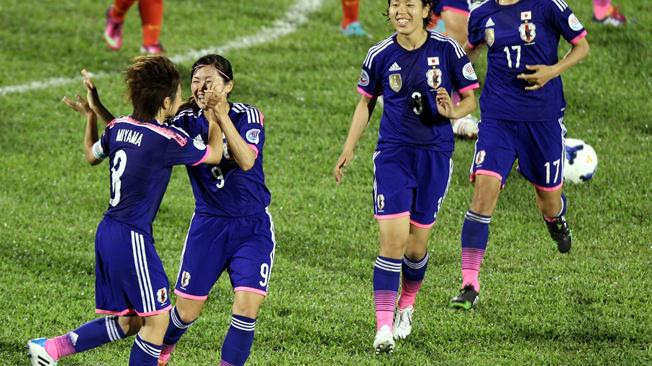 Five Asian nations will qualify for the FIFA Women’s World Cup Canada 2015. Australia and Japan join China PR and Korea Republic, who qualified on Saturday. One more Asian nation will qualify on Wednesday 21 May. In all, 20 nations from Asia participated in the FIFA Women’s World Cup Canada 2015™ Qualifiers, with earlier rounds played in May and June 2013. The eight final teams in the hunt for a Canada 2015 ticket were Australia, Japan, Jordan, Vietnam, China PR, Korea Republic, Myanmar and Thailand. Along with four nations that qualified through the group phase, a fifth nation will qualify through the match for 5th place on 21 May. That match will feature Vietnam playing either Myanmar or Thailand. From 4 April 2013 to 27 November 2014, more than 125 nations will participate in the qualification phase for the FIFA Women’s World Cup Canada 2015. The final competition, which runs 6 June to 5 July 2015 from coast to coast across Canada, will feature 24 finalists including host Canada.